Albert Einstein was a German theoretical physicist who developed the theory of general relativity. He is generally considered the most influential physicist of the 20th century. For this achievement, Einstein is often regarded as the father of modern physics. Albert Einstein (March 14, 1879 - April 18, 1955) was a physicist and mathematician who proposed the theory of relativity. He also made major contributions to the development of quantum mechanics, statistical mechanics and cosmology, and is generally regarded as the most important physicist of the 20th century. He was awarded the 1921 Nobel Prize for Physics for his explanation of the photoelectric effect and "for his services to Theoretical Physics"; however, the announcement of the award was not made until a year later, in 1922. In 1999 Albert Einstein was named "Person of the Century" by Time Magazine. 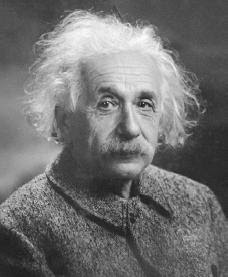 In popular culture, Einstein has become synonymous with someone of very high intelligence. His face is also one of the most recognizable the world-over. In his honor, a unit used in photochemistry was named after him. An einstein is equal to Avogadro's number times the energy of one photon of light. The chemical element Einsteinium is named after the scientist as well. Abram Joffe, in Einstein's biography, argues that Einstein was assisted by his wife Mileva Maric, who was a mathematician. After Six weeks later of Einstein's birth the family moved to Munich, where he later on began his schooling at the Luitpold Gymnasium. Later, they moved to Italy and Albert continued his education at Aarau, Switzerland and in 1896 he entered the Swiss Federal Polytechnic School in Zurich to be trained as a teacher in physics and mathematics. After working hard in the laboratory but skipping lectures, Einstein graduated with an unexceptional record. In 1901, the year he gained his diploma, he acquired Swiss citizenship and, as he was unable to find a teaching post, he accepted a position as technical assistant in the Swiss Patent Office. In 1905 he obtained his doctor's degree. Albert Einstein subsequently enrolled at the Technische Hochschule, in Zurich. That same year, Einstein renounced his German citizenship, becoming stateless. In 1898, Albert met Mileva Maric, a serbian classmate (who was also a friend of Nikola Tesla), and fell in love with her. In 1900, Einstein was granted a teaching diploma by the Eidgen?sische Technische Hochschule. He was accepted as a Swiss citizen in 1901. Einstein and Maric had an illegitimate daughter, Liserl, born in January 1902. Upon graduation, Albert Einstein could not find a teaching post. He began working as a technical assistant examiner at the Swiss Patent Office in 1902. At the Swiss Patent Office, Einstein judged the worth of applications by the inventors, rectified their design errors, and evaluated the practicality of their work. Einstein married his first wife, Mileva Maric, on January 6, 1903. Einstein's marriage to Mileva was both a personal and intellectual partnership: Einstein referred lovingly to Mileva as "a creature who is my equal and who is as strong and independent as I am". On May 14, 1904, Albert Einstein's son Hans Albert Einstein was born. In 1904, Einstein's position at the Swiss Patent Office was made permanent. He obtained his doctorate after submitting his thesis "On a new determination of molecular dimensions" in 1905. That same year, he wrote four articles that provided the foundation of modern physics, without much scientific literature to refer to or many scientific colleagues to discuss the theories with. Most physicists agree that three of those papers (Brownian Motion, the Photoelectric Effect, and special relavitiy) deserved Nobel prizes. Only the photoelectric effect would win. This is something of an irony, in that Einstein is far better-known for relativity, but that the photoelectric effect is all quantum, and Einstein became somewhat disenchanted with the path quantum theory would take. What makes these papers remarkable is that, in each case, Einstein boldly took an idea from theoretical physics to its logical consequences and managed to explain experimental results that had baffled scientists for decades. Albert attended a Catholic elementary school from the age of five for three years. Einstein was later transferred to the Luitpold Gymnasium where he received advanced primary and secondary school education. It is extremely ungrateful to try to fully apprehend the array of achievements of Albert Einstein due to complexity of his work and also quantity. Therefore we will only consider few of the more important and also interesting. Einstein’s “Zur Elektrodynamik bewegter Körper” (“On the Electrodynamics of Moving Bodies”) was received on 30 June 1905 and published 26 September of that same year. It reconciles Maxwell’s equations for electricity and magnetism with the laws of mechanics, by introducing major changes to mechanics close to the speed of light. This later became known as Einstein’s special theory of relativity. Due to his research paper based on electrodynamics an idea of time-space frame of a moving body appearing to slow down and contract when measured in the frame of the observer appeared. In his paper regarding mass-energy equivalence, Einstein produced the famous E=mc2 from his special relativity equation. Einstein created the quantum theory of light, the idea that light exists as tiny packets, or particles, which he called photons. Alongside Max Planck’s work on quanta of heat Einstein proposed one of the most shocking idea in twentieth century physics: we live in a quantum universe, one built out of tiny, discrete chunks of energy and matter. Following his research on general relativity, Einstein entered into a series of attempts to generalize his geometric theory of gravitation to include electromagnetism as another aspect of a single entity. In 1950, he described his “unified field theory” in a Scientific American article entitled “On the Generalized Theory of Gravitation” in an effort to unify other laws of physics with gravity. During his research Einstein collaborated with others to produce a model of a wormhole. His motivation was to model elementary particles with charge as a solution of gravitational field equations. These solutions cut and pasted Schwarzschild black holes to make a bridge between two patches.